Applecross and Torridon are home to some of Scotland's most magnificent mountain scenery, and this route allows you to appreciate it to the full. The main route shown in dark blue on the map is 84 miles long and should be tackled clockwise. This makes the most of the views, and tends to keep the sun behind you as far as possible. 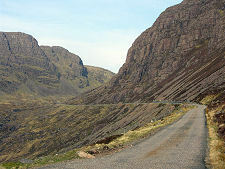 The route includes a number of significant lengths of single track road and it enters the Applecross Peninsula via the Bealach na Ba, possibly Scotland's most challenging and highest road: whose entrance is guarded by signs warning you it is unlikely to be open in winter and that it is inadvisable for learner drivers. Three excursions from the main route are suggested, all using exclusively single track roads. The trip from Lochcarron to Strome Castle is 4 miles each way; and the diversion to Torridon and Lower Diabaig is 8 miles each way. The road south from Applecross to Toscaig and Ard-dhubh is shown as an excursion on the map, and is 5 miles each way: but if you miss it, you miss much of what Applecross has to offer, so it is highly recommended rather than just optional. 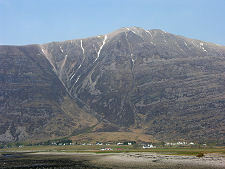 The route description assumes a starting point in Achnasheen. From the roundabout just to the west of the village you follow the high quality A890 along the broad upper reaches of Glen Carron to Achnashellach Station, where the glen closes in and the road becomes single track. It remains single track for much of the remainder of the trip down to Lochcarron. From Lochcarron you have the option of following the minor road down the lochside to Strome Castle (5 miles each way), overlooking the old crossing of Loch Carron at Strome Ferry. The ferry has long since been replaced by a road that remains prone to rockfalls along the far side of the loch. Back in Lochcarron the road continues over high ground to the west before dropping to the head of Loch Kishorn and the scattered settlements collectively referred to as Kishorn. A little beyond the remarkable Courthill Chapel a turn at the head of Loch Kishorn leads to the Belach na Ba, a spectacular single track road that squirms its way up the face of the Applecross Mountains before descending more steadily to the coast and the village of Applecross. From Applecross you should take the five mile each way excursion south, taking in the settlements of Camusterrach, Ard-dhubh and Toscaig. Once back in Applecross you the Applecross Heritage Centre is well worth a visit, and you then follow the single track road road north along the west coast of the peninsula, before turning to head east along its north coast. The road twists and turns, giving you ever more fascinating glimpses of the Torridon Mountains to the north east. Not far before the end of this road a high point that can be difficult to spot gives you superb views of Shieldaig with the mountains beyond. On reaching the A896 you turn left, arriving almost immediately in Shieldaig. Much of the village lies just off the main road, but it is one of the gems of north west Scotland and shouldn't be missed. Beyond Shieldaig the road sports a white line down the middle as far as Torridon, en route giving you more spectacular views of the Torridon Mountains. To see the village of Torridon itself you need to turn off the A896 along the minor road that goes round the north side of the head of Upper Loch Torridon, under the imposing flank of Liathach. 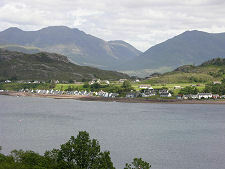 The Torridon Countryside Centre stands at the junction with the A896 and is well worth a visit. If you take the optional excursion and follow this single track road through the village of Torridon, it takes you along the north shore of the loch for 8 miles to Lower Diabaig, another fascinating little settlement. The main route continues along the now single track A896 through Glen Torridon, close to the side of two of Scotland's most magnificent mountains on your left: first Liathach, then Beinn Eighe. For many this is the most magnificent of Scotland's glens. At the far end of the glen the road emerges at a T-junction in Kinlochewe. Here you turn right to follow the A843, now a high quality modern road, back to Achnasheen. Distances: The main circular route covers 84 miles. The shortest transits to it are: from Inverness, 42 miles each way; from Kyle of Lochalsh, 20 miles each way. 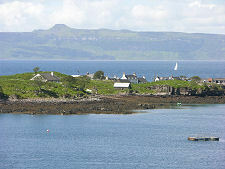 Three suggested excursions add: Strome Castle, 4 miles each way; Toscaig and Ard-dhubh, 5 miles each way; and Lower Diabaig, 8 miles each way. Fuel: There are petrol stations open at least some of the time at Lochcarron and Kinlochewe.